Today I want to talk to you about studying poker, and more specifically, sharing my study routine with you. This is especially useful if you don’t already have one, but if you do have a study routine, maybe you can take bits and pieces of this and make improvements on yours. The thing that we have to keep in mind is that we’re not going to become the best poker player in the world overnight, or in a week, or even in a month. It’s going to take long periods of time. Even just becoming the best poker player you can be is going to take a long period of time, but if we can break this up into week-long sprints and we can say, “Okay, this week I’m going to try this leak, the next week another, the next week another,” if we can do that and keep improving our game and decreasing our poker leaks, we’re going to become better players over time. The way that I set this up is through a week-long time box. With that said, let’s talk about the way that that week should be breaking down. Well, at the very beginning of the week, you want to start by choosing your topic. So choose your major focus topic for the week. That’s not to say that you’re not going to work on other things simultaneously. Say you wanted to work on squeezing this week, you’re going to also be working on things like sizing that squeeze and hand-reading preflop and setting up for preflop, all those things. Choose one major topic and understand that you will touch on other things simultaneously. Now, here’s the thing. Some people will watch this and say, “Well, I don’t really think I need too much work on things.” I’m just going to call major BS on you. Every single poker player needs work on certain parts of their game. Some more than others. Some less than others. That’s fine, but everyone needs help on something. So choose something that’s going to not only be something that you need work on, but also impact your win rate. If you’re newer to poker, it’s more important that you learn how to play your monsters right this moment than learning how to river bluff check-raise in very, very specific situations. Choose spots that are going to impact your win rate the absolute most. And if you don’t know where to start or you’ve never really thought about this before, just spend the next 20 minutes and brain dump all of the spots where you feel uncomfortable or confused, or in situations where you’ve heard people talk about something, be it squeezing or double-barreling or when to turn check-raise, all those things. Then take a moment and rank all of those by importance and by order of win rate impact. Is something going to impact your win rate more if you study right at this moment? If so, that might be the thing that you choose for this week. Again, choose a topic that works best for you if it’s something that you need work on right at this moment. Newer players benefit the most from studying preflop and flop strategies at first. More intermediate players tend to need study time for turn and river play. After you choose your topic, it’s time to actually get working. I always suggest during a given week that you read at least two poker articles on this topic. If you have a book or you have some solid chapters in a book that are on this topic, then definitely use those. They can either replace the two articles or they can be with the two articles, but definitely make sure you spend some time reading this topic. If you are doing this diligently, and you should be, you want to keep a journal while you’re doing this kind of stuff. It can be a Word document or a Google Drive doc, it doesn’t really matter. Just make sure that you’re writing. And while you’re studying this stuff, you want to write down what your learn, but also write down any new questions that come up while you’re studying this. If you’re reading an article and a coach suggests squeezing X, Y or Z hand, then think about why that is the case. If you can’t come up with a clear answer, write it down. While you’re studying this throughout the rest of the week, you’re going to be looking to answer all those next questions that come up. When you first choose a topic, you have a very basic question like how do I squeeze, or how do I double bluff? And then when you’re digging down deeper and deeper, more and more questions will arise. Your goal is to answer those as well. Once you can answer not only the major topic question but also all these sub-questions that come up, that’s what’s going to help you become a really well-rounded player. If you don’t have a training site subscription because you’re saving bankroll right now, no problem whatsoever. Youtube and Google are going to be your best friend. If you haven’t already checked out this little trick, it’s awesome. Just search for splitsuit and then whatever topic you’re searching for. Whether you’re doing that on Youtube or Google, chances are you’re going to find at least something that can get you started. Remember, you might have to check it a couple of different ways. If you’re looking for how to play AA, search for splitsuit AA or splitsuit pocket Aces. You’re going to find something in there almost guaranteed. When searching Google or YouTube use “splitsuit XYZ” where XYZ is the concept you want to learn more about. This will almost always turn up a video or article that you can jump into. So make sure throughout the week you’re watching at least one video. The more study time you have, maybe you’ll make that two or three videos. The more work you need on that, maybe a couple more, but make sure you’re making this a habit and constantly looking for new ways to study. Yes, articles are one way, books are one way, videos are another way, but there’s plenty of other ways as well. I know that posting is not everyone’s favorite thing and I know that a lot of players are very against posting. Either they posted on bad forums in the past or they’ve gotten trolled, or they really just don’t feel comfortable with the whole thing. But I promise you, it’s incredibly beneficial. If you don’t already have a forum, I would definitely suggest checking us out over at Red Chip. We have a great one that is extremely friendly. We post on everything from cash games to tournaments and everything in between, so I definitely suggest checking that out. You need a forum right this moment, but definitely make this a habit. Honestly, if you use forums correctly, you’re going to be posting more than once per week. I would suggest at least starting there if you’re new to it. Again, just either find an existing thread and ask some follow-up questions or start a new thread. I assure you it’s going to help tremendously. Get in that group consensus and get in some more ideas. Opening up your poker network is going to be a huge benefit in the long run. Remember, you get what you give when it comes to poker forums. Also offer your own opions on other player’s hands. Your insights can help keep a conversation moving and help the community as a whole! The next thing I want you to do is spend some extra energy focusing on this topic while you’re playing sessions during the week. It’s not that you abandon the other facets of your strategy or you only focus on this one concept that you’re working on, but I want you to spend some extra energy focusing on it. Even if you don’t yet in real-time, at least be focusing on that situation and related situations and what you would be thinking about in that spot. Again, you’re not abandoning other parts of your strategy. You’re just giving a little bit more time and attention to this when you’re in real-time. Even if you don’t pull the trigger yet, that’s okay. Just be thinking about this. I assure you, it’s going to help in the long run. It may seem a little bit weird at first, but you’ll get used to this over time. Especially when you’re choosing the right topics for you. You’re going to notice situations like this coming up, and you’re going to notice spots that you’ve been passing up on in the past. As you get later into the week, make sure to check your journal. Remember, throughout the week you’ve been keeping this journal. You’ve been writing down things that you’ve learned, new questions that you’ve developed, any ideas for future study topics that may have been related to this. Again, if you’re working on squeezing, you might realize that you need a little work on flop play first. Maybe that’s what you end up working on the next week or the week after that. At the end of this week of study, I want you to go back and read your journal real quick. Read your notes, and see if you’ve managed to answer any of those questions that you’ve written down along the way. Maybe you have, maybe you haven’t. If you haven’t, it’s something that you want to read a quick article on or watch a quick video on or maybe just add that as your study topic for next week. Trust me, this can be a very illuminating experience, especially if you’ve never done it in the past. Then in preparation for the next week, think about your next topic and prepare to do this process again next week. Every couple of months, I want you to go back and review this journal that you’ve been keeping, and especially keep track of those strategy chapters that you wrote. Go back, reread those and say, “Wait, am I improving on this? Am I understanding this deeper? Did I write something about this in the past?” Go back and change that and update it with your new information because over time as you’re continually studying, you’re going to get more and more information, you’re going to think more logically and more strategically and have a better understanding of the stuff you wrote months ago. Then every couple of months, maybe once a quarter, I want you to make sure you zoom out, look at your current leaks, and then plan your next few weeks of study topics. Study topics should be used for one of two things, either to improve your playbook or to fix leaks. Often with leaks, if we’re not looking for them, we can get lazy, we can brush over them, and leaks are really what we want to be studying, right? Because once we identify a leak, we work on it, we study it, and all of a sudden, that leak is no longer impacting us and no longer becoming a loss rate scenario. Instead, it’s being flipped into a win rate scenario. So make sure you’re doing this. I know it’s a little cumbersome and takes some time. But if you make this a habit, it won’t feel hellish. Even if you’ve been out of studying for a long time, trust me, the habit will make it much easier. Then you just rinse and repeat this process forever. I know it takes time. I know it’s going to take a little bit of effort. But I assure you, if you put the time and effort into it, your poker strategy as a whole is definitely going to benefit. So make sure to be diligent with this, don’t be lazy, don’t skimp on it. If you’re serious about becoming a better player, understand that it takes work, but it’s not too, too much. If you really break it down, maybe it’s a couple of hours per week. Trust me, fixing up your leaks in just a few hours is going to be hugely profitable. This is the study routine that I would suggest, especially if you don’t already have one. It’s not too difficult. Choose a topic that’s going to impact your win rate. Read some articles on that topic. Watch at least one video on that topic. Post a little bit on that topic. Spend some extra energy on that topic when you’re actually playing in real time and make sure to keep that journal. Remember, if you can get used to that, write down extra questions that come up, try to answer those questions. At the end of every week, write a few paragraphs as if you were writing a strategy chapter in a book. It’s going to be extremely beneficial in the long run, so you can go back, you can review those, you can continue patching leaks and improving your strategy along the way. This entire video is actually inspired by a very small subsection of one of the chapters in my brand-new book “Unfolding Poker”. “Unfolding Poker” is my chance to give advanced answers to some of the most frequently asked poker questions. These are questions I get from students, forums, Youtube comments. It’s my chance to give you clear and actionable answers that you can start putting to use in your next session. This book comes in e-book form, paperback form, and also the audio book form if you really like listening to content instead of just having to read it. If you’re interested in this, check it out. It’s splitsuit.com/unfold. Again, this whole video was inspired by just a small subsection from the chapter all about how to study and improve faster. 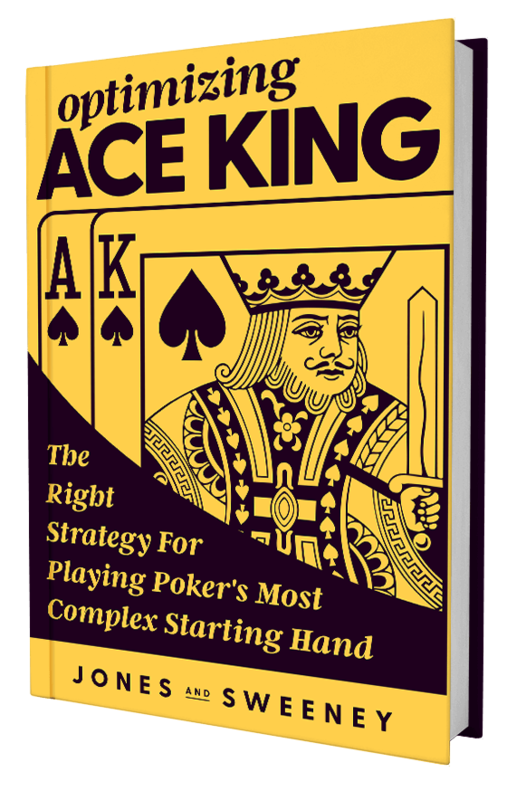 There are also chapters on running it twice, cbetting on multiway flops, when to change bet sizes, and more. If you’re interested in this, you can learn more at splitsuit.com/unfold. I’d also like to take a quick moment to thank my sponsor for this book, BBO Poker Tables. If you’re looking to get started and customize your own poker table from scratch today or choose from a selection of pre-built ones, get started at bbopokertables.com and use the code SPLITSUIT at checkout to get a special gift. And that’s going to wrap it up for this article. Hopefully you’ve learned a little bit about how to study better and this helps you start building your own study routine. Good luck out there!